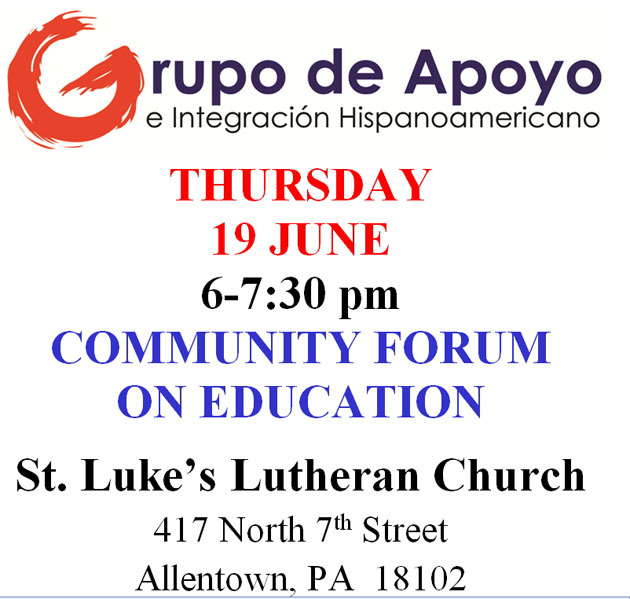 Erika Sutherland and her group Grupo de Apoyo e Integracion Hispanoamericano are hosting a Community Forum on Education in center city Allentown. The event is planned for Thursday, June 19 from 6-7:30 pm at St. Luke’s Lutheran Church at 417 N. 7th Street. We hope to attract a lot of parents, community leaders, and other interested people to raise issues and ask any questions they have regarding education. Some questions might have simple answers that someone else in the room can provide. Others might be more open ended, such as “What do you want and expect from the school and from education itself?” This will be a time for everyone to share and listen. We particularly want to give voice to those who don’t usually get their questions and ideas heard. We hope we can identify people from Allentown with the interest and commitment to help us transform education there. Please share this information in any way you can. We particularly hope to attract Allentown center city residents. It should be a very interesting and productive evening. A copy of a flyer about the forum in both English and Spanish can be downloaded from here: Forum Flyer. ← What Do We Need From Public Education Today?